A Wide Choice of Colours and Shade For Every Taste Venetian Blinds offers you more than 100 devorator colour to suits any colour scheme. It become an important interior fitting, combining privacy, control of light and colour balance of the decorative scheme of your room. For individual taste, slats can be replace with different colours to match the floor colour or some other feature in the surrounding. The limits to use Venetian Blinds are set only by your imagination. It gives a personal character to a room, whether it be a kitchen, bathroom, living room or children play-room. 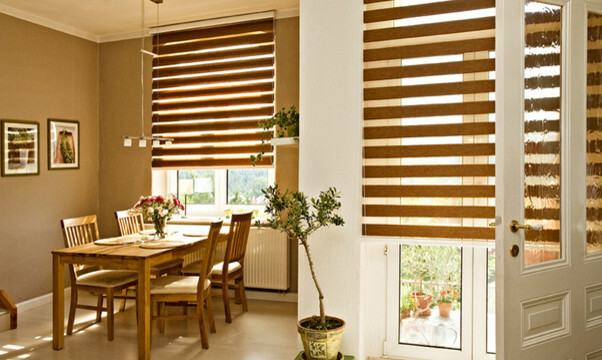 Make the most natural light elegant with 127 MM Vertical Blinds. Easy light control with the pull of ball chain or part in their own sliding track. Beautiful ranges of colours in textures (SPAIN) suitable for any room are available. They are light weight, durable and complete imported fitting. Most suitable for large window and are perfect as attractive room dividers. Enhance to a rich decorative element to your interiors. In today modern architecture design, glass facades and large windows are very popular. The natural light of the sun is being play around for optimum environment in our working and residential areas. Therefore, we introduced Roller Sunscreen concept to make the most out of the sunlight for every situation. When the sun's heat become too intense, we can lower a roller blind which can be moved away again when the sun dissapears. At the same time, the view toward the outside remains intact and daylight continues to enter the room virtually unobstructed. Chain Operated Roller System Felton offers a range of Automatic System which are compatible with existing Building Intelligent system for greater comfort, security and energy saving operating. Zebra Blinds are a twist on classic sheer shades because of their patterning. Stripes can be played up as a fun style for your home, or as a sophisticated innovative window treatment. Bands of semi-opaque and sheer woven fabric are incorporated into the shade. When you want your shades closed, the sheer shades disappear as semi opaque bands are lined up together. While a soft light will still get into the home, it will still keep your home area private. When shades are in the open position, the semi-opaque bands are not aligned, and thus the sheer stripes will allow light into your home.